The answer to the question “Don’t you two ever get tired of Thai food?” is “No. No we do not.” Same goes for tacos. It also applies to fusion tacos. Anyway, we’d spent the afternoon setting up for Veg Fest (along with our amazing volunteers and the rest of the fest committee) and even though we didn’t have far to go to get home, we were in no mood to cook, so we stopped at Top Spice restaurant for dinner. It’s one of our favorite places and we always get the same two dishes to share. This time, Seth decided to branch out a bit and we tried something new. Well, it was new to him. I used to get it for lunch sometimes when my office was just a few blocks from there. 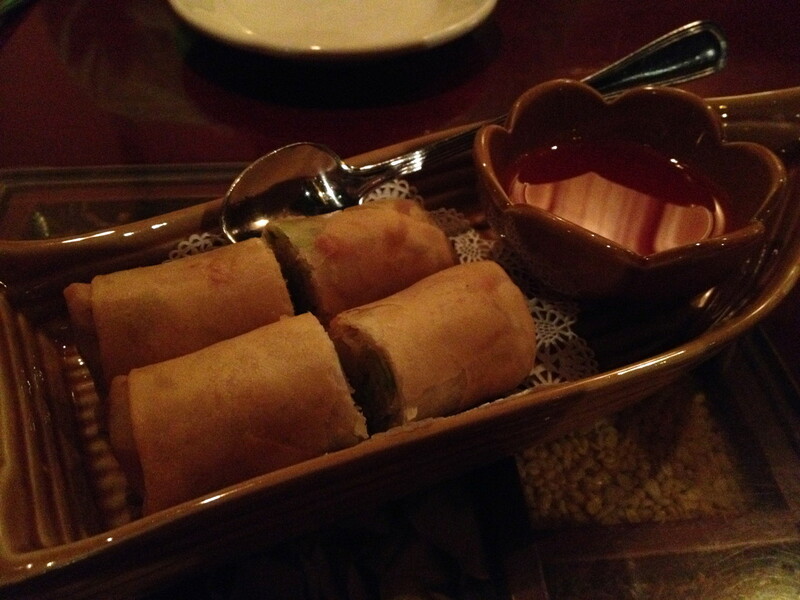 We started off with spring rolls, which they confirmed do not have egg in the wrappers. We always get them and they’re yummy. Basic restaurant rolls, but good. 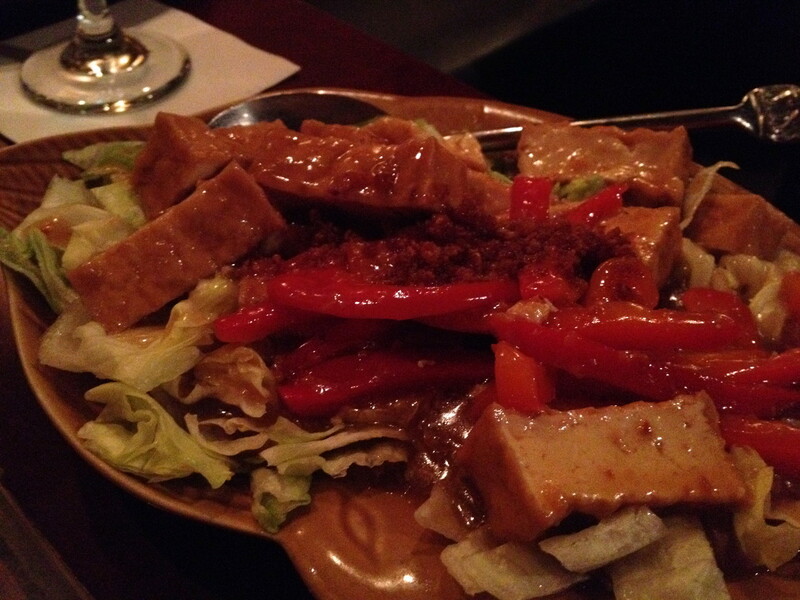 The dish we ordered that we always get was Tofu Garlic Pepper, which is stir-fried tofu and red bell pepper topped with a whole bunch of crispy garlic and served in a delicious brown sauce over a bed of iceberg lettuce. I know, the lettuce sounds weird, but it’s really good. I don’t normally like iceberg, but it’s good here. I promise. 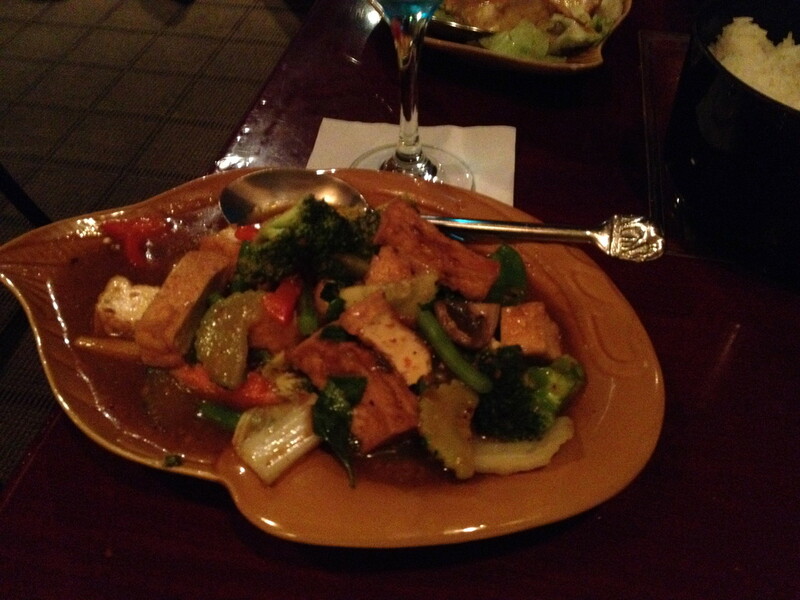 The other dish we ordered was Spice Tofu with Vegetables. It’s pretty much what it sounds like. It’s the one Seth had never had before and he really liked it. We then went home and prepared ourselves for what was going to be a long, exhausting, but wonderful day at Atlanta Veg Fest. The bed of iceburg sounds great! I actually did something similar with Chinese leftovers yesterday - heated up my leftover garlic tofu and veggies, then tossed in the rest of my iceberg salad. I love that combo of hot and cold. Yes! 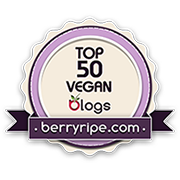 I love how the sauce kind of wilts the lettuce a little bit, but it still stays cold & crisp. I love using leftovers (especially tofu & seitan) in salads. 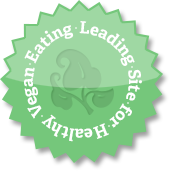 Blackened tofu is amazing in a salad with "ranch" dressing.